This 1/2" thick, tempered-glass vessel is leaf-shaped, with a translucent-green appearance and dark veins throughout. Its interior is smooth while its exterior has a stippled texture. Its non-porous surface is extremely attractive and sanitary - naturally resistant to stains, odors, discoloration, and heat damage. With an overall measurement of 23 1/4" x 14 1/2" x 4 3/4", it will require a minimum-width cabinet of 24". The waterfall faucet features fully-tested, superior-quality, solid-brass components. The matching disc which circles the spout is made of the same material as the basin below. While several MR Direct vessel-style faucets may nicely complement this bowl, the waterfall design is simply stunning. This tall metal fixture gracefully bends over the basin with a slender, joystick-style toggle at the top for control of water flow and temperature. Around the neck of the shaft is a seven-inch diameter disc over which water cascades from the tall spout and into the distinctive basin. The shaft features an attractive oil-rubbed bronze finish. The included sink ring stabilizes the curved bowl above the counter and coordinates with the oil-rubbed bronze finish of the other fixture's. 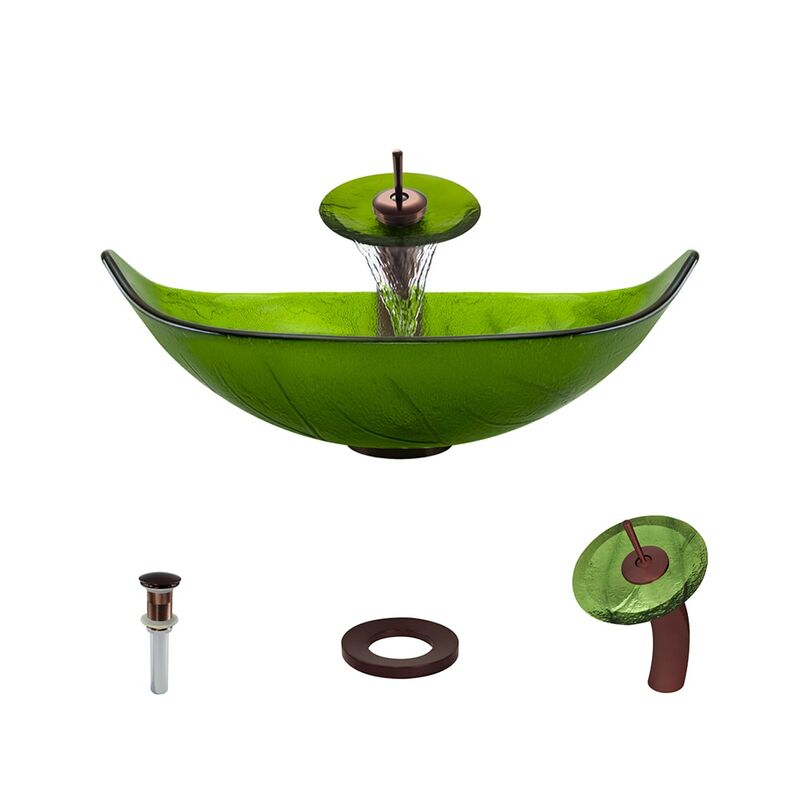 Additionally, a spring-loaded, vessel pop-up drain (vpud) is included, which opens and closes with a simple press to its attractive oil-rubbed bronze cap.